The work-from-home office has been running quite successfully from the cottage for the past two weeks. There were the usual teething problems, internet hiccups etc but the technical glitches are being gradually ironed out. The interior spaces still need some tweaking and the builders are still installing guttering, but in general, it’s working out pretty much as planned. To put a stop to dirt and grit being tramped onto the lovely wooden floors, we needed to do something about the access quickly and I asked a friend of mine who runs a small gardening business to give me some help. I had a good idea of what the end result should look like and this morning Marion arrived with her little team of workmen and got straight to work. She also recommended someone to install the sprinkler system for that small area, which will run off a separate control panel from the main house. He came along too and by the end of today we had not only a very promising garden but also a functional watering system. After all the delays, excuses and mistakes we’ve become accustomed to hearing over the past year, this almost seems too good to be true. Cottage Garden from the East. 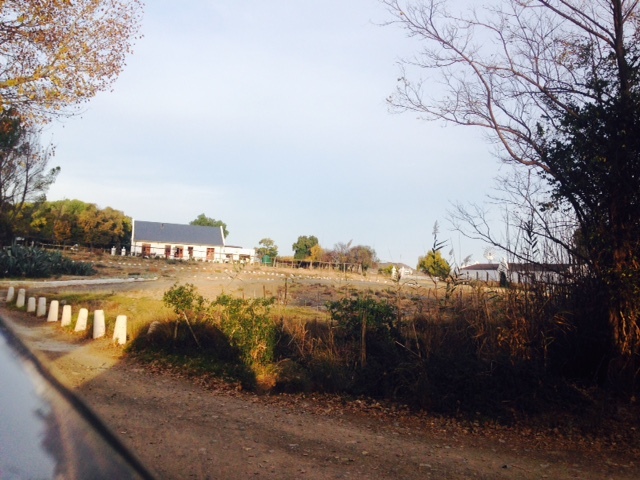 The picture above is taken from the cottage carport on the east side. 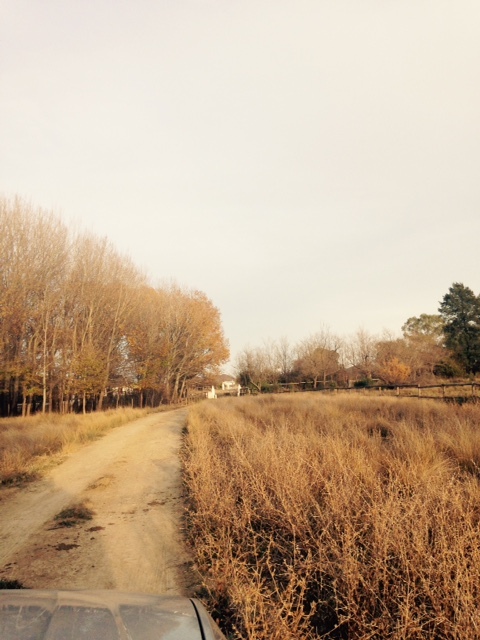 The strip of red in the background is the gate from the street to the main house. It still needs to be painted white. 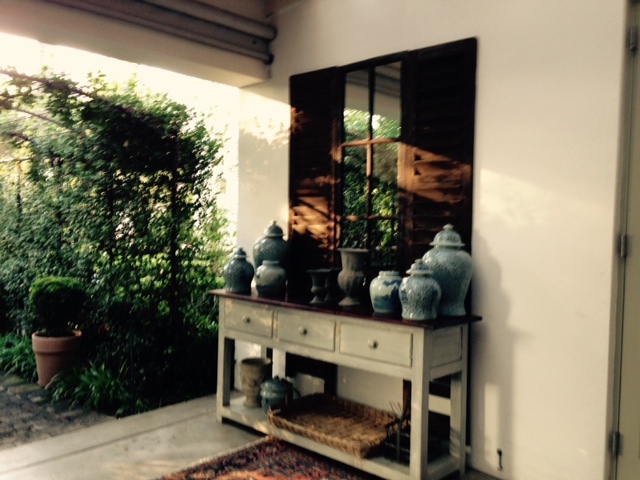 The terra-cotta pots on the veranda came from our old home. They have been ‘stored’ in a corner of the site since the end of February and have somehow survived the dust and general chaos. In fact the cymbidium has a spray of buds and looks likely to flower soon. In the middle of the white, boundary wall on the left, you might notice a ‘box’ with two black dots; that is a burglar alarm beam. Seemed like a sensible place for it a few months ago but now I will need to be careful not to allow anything to grow tall enough to interfere with the beam. This small patch of garden is on the south side of the cottage so we’ve chosen plants that don’t need a lot of sun, including azaleas and clivia. 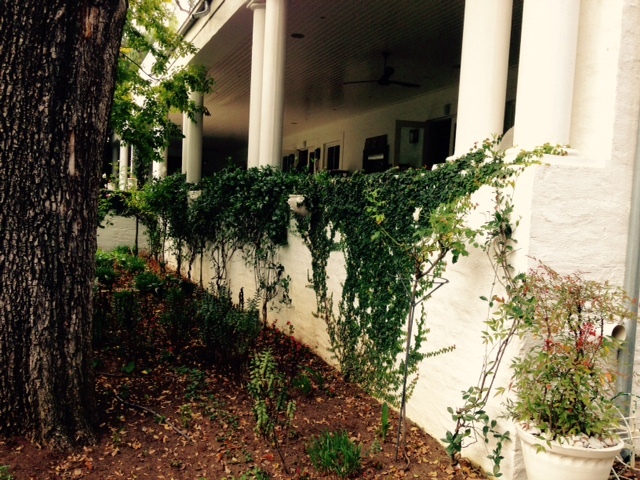 We’ve also planted several baby ‘tickey’ creepers along the wall. They’re slow-growing but will ‘soften’ the walls nicely once they’re established. To avoid any need of a lawn mower, we’ve put down pavers interspersed with ground cover. Hopefully all the bits of bare ground will be covered soon. Cottage Garden from the West side. And while we’re talking about gardens and watering systems, I thought I’d include a photo of the water tanks which have been installed – not without some difficulty – in the ‘bunker’ behind the pool. One of two water storage tanks. This water tank is directly in front of a second, identical one. 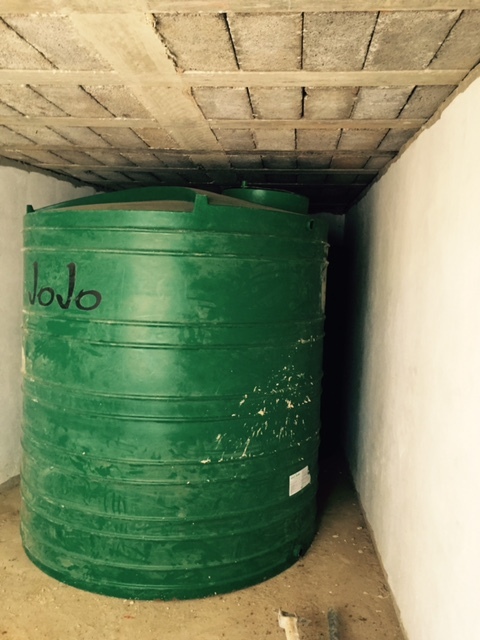 Each tank holds 4500 litres of water much of which will come directly off our roof during the rainy summer season. With our municipal water supply having been quite erratic over the past few years, it seems like a good idea to have other options in place. 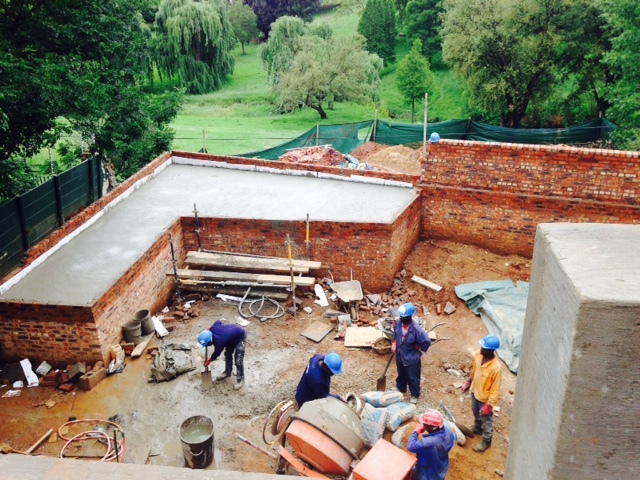 The ‘bunker’ while still under construction and before the start of the pool. Looking at the photo above again, it is clear that a lot has happened since it was taken, but progress does still seem to be painfully slow at this stage. Hopefully the garden will be more cooperative! 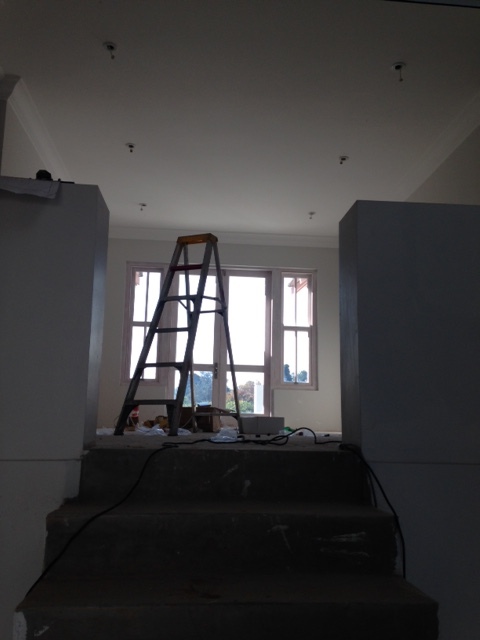 It’s been almost 3 months since we migrated down to Cape Town to wait out the final stages of our building project. When we left Johannesburg, we were hopeful that the house might be finished by April and when it became clear that it would not be, we set our sights on the end of May. As the finishes started going in, we also realised that one of us, but preferably both of us, needed to be either on site most of every day, or close enough so as to be able to get there fairly quickly to answer the seemingly endless string of queries that crop up at this stage. 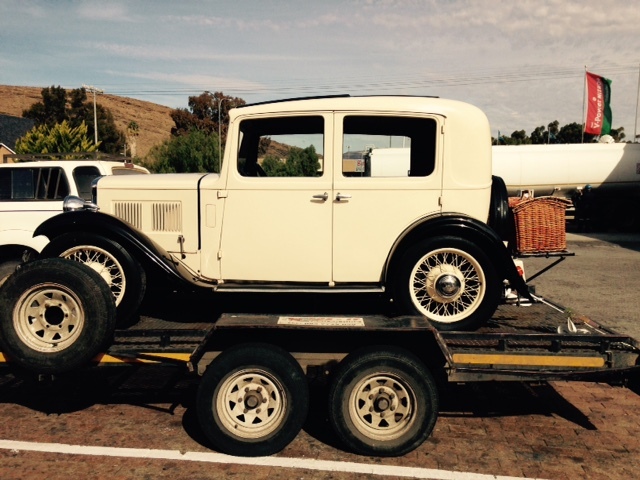 So, on Sunday the 17th of May, we packed up in Cape Town, loaded Daisy into the car again and set off on the long road north back to Johannesburg. 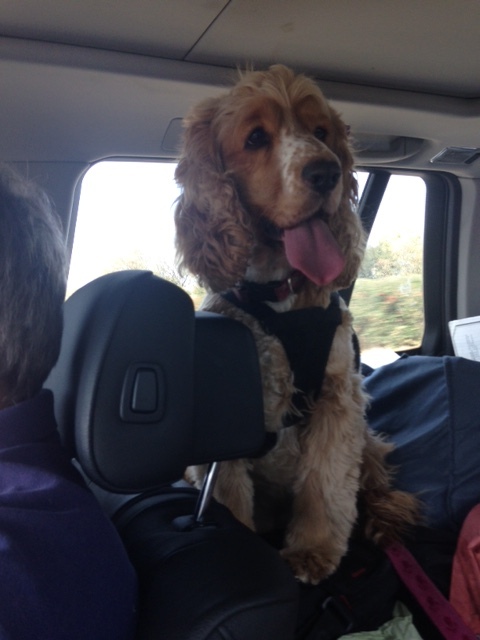 Fortunately we both enjoy road trips and Daisy has proved herself to be a very good traveller. 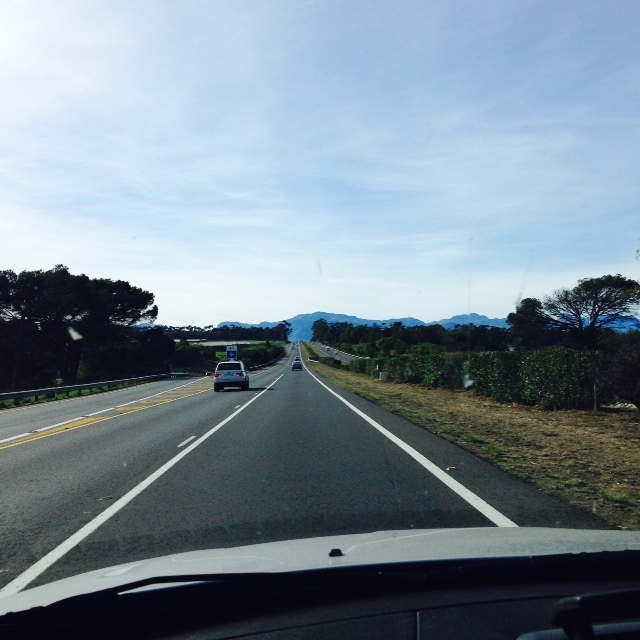 The long, open road, spooling out ahead gives one ample time to adjust to the change of environment from the laid-back coastal atmosphere of the Cape to the frenetic, somewhat disorganised one of Gauteng. 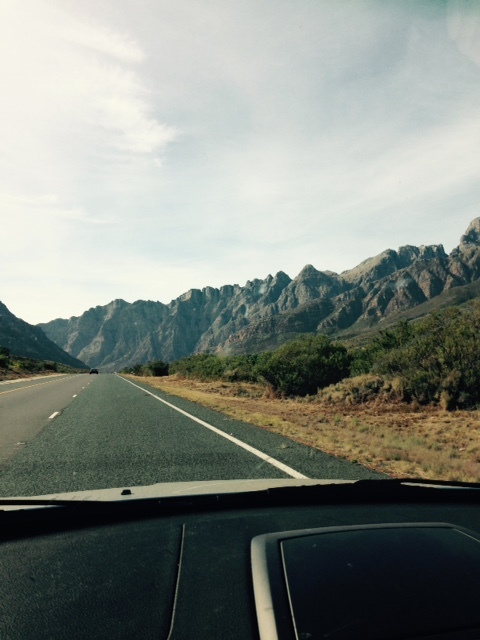 The last of the mountains before entering the Karoo. 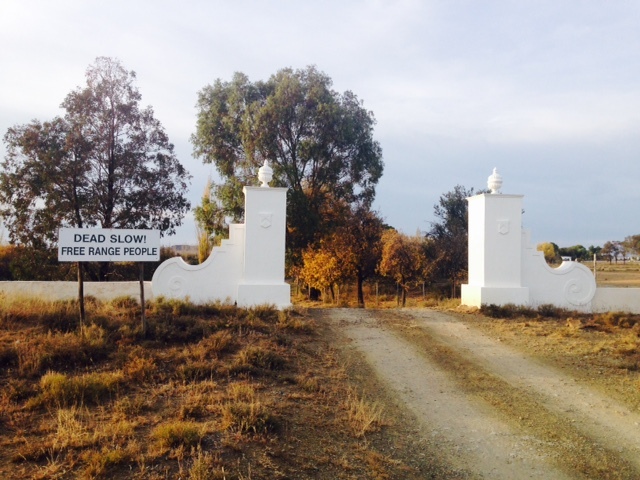 And eventually, after about seven and a half hours on the road, we arrived at Kuilfontein Farm, about 12 kilometres outside of Colesberg. 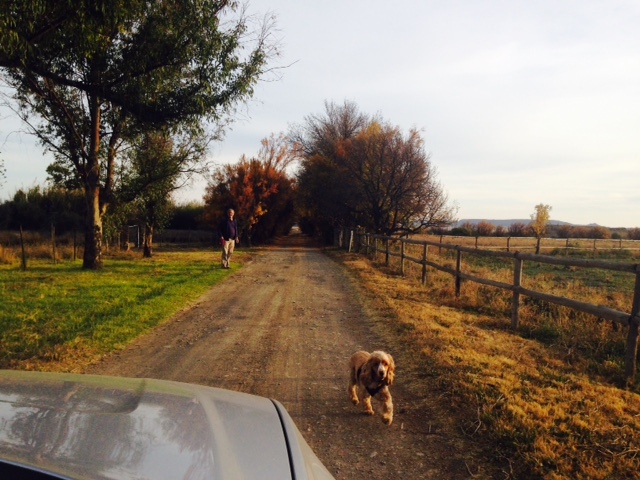 We’ve been stopping over there for years, not least because they have a special section of accommodation called The Paddocks where dogs are also welcome. We set off quite early on Monday morning but not before giving Daisy a bit of a run. We arrived back in Johannesburg at about 2pm in time to check into yet another guest cottage and to do a quick check on the progress of the house. We had thought we might be able to move in during the first week of June but what we found was not very encouraging and that idea has been scuppered. This does not look like a house ready for occupation in 12 days. The flooring and carpeting was scheduled to go in this past week but instead, we’ve had to postpone both installations for approximately 2 weeks. Ideally both the wooden floors and the carpets should go in after all other internal work is complete. It has become clear over the past few weeks that the contractor and the electrician have had some conflict and the electrical work seemed to have come to a complete halt. At this stage the contractor is – unsurprisingly – avoiding all contact with us and from my point of view that’s probably best as I simply don’t know what I could find to say to him right now. I rather hope I never have to see him again, ever. For the past three months all our dealings have been with the site manager only. Fortunately on Tuesday I eventually managed to contact the electrician directly and the impasse has been breached. His team is back on site and making good progress. In the four working days that we’ve been back from Cape Town, we’ve managed to move things along quite a bit so it seems we made the right decision to be here fulltime from now on. Although, having said that, this gypsy lifestyle has begun to pall somewhat. 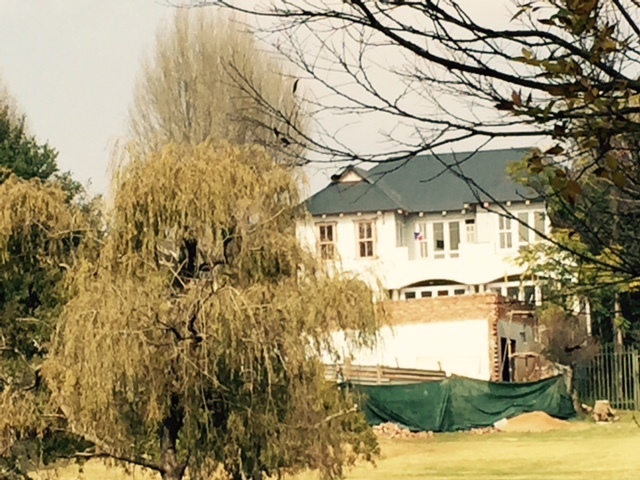 View of house today, May 23rd 2015. The green netting is around building materials that have been stored in the park much to the dismay of some of our neighbours. Repeated requests that the builders keep this area tidy and keep the quantity of material stored to a minimum have gone unheeded. We will have to do some serious grass planting and rehabilitation here when spring comes around. Where the wall ends on the right, you can just make out a space before the neighbour’s fence begins. Our gate into the park will be going into that space. The opening you can see in the wall just as it turns a corner back towards the house, is the underground ‘bunker’ which will house the increasingly essential generator and also, water storage tanks which were delivered and installed – not without some difficulty – last week. To cheer ourselves up after our first visit back on Monday, we went for a walk in the park which – unlike the house – was looking immaculate. An unexpected bonus of having to manage this stage of the building process from a distance, has been the discovery – so far – of two lovely, privately owned guest houses very close to our new home. 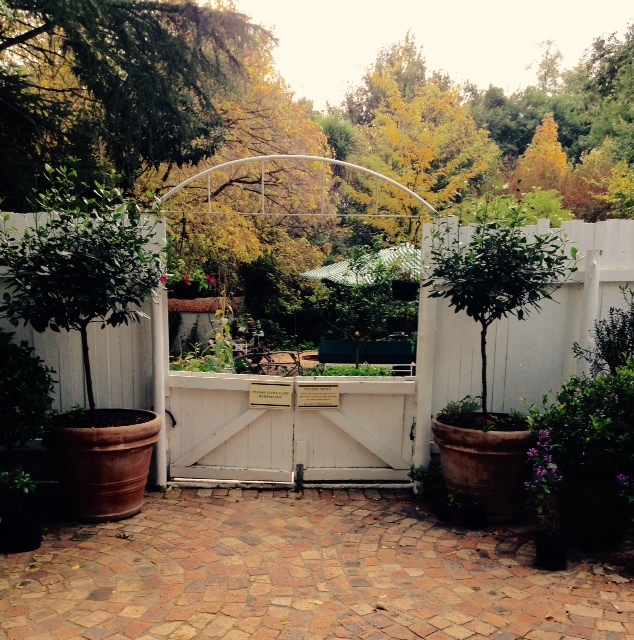 Feeling that I cannot always rely on the generosity of friends on my flying visits up to Johannesburg, I’ve recently stayed in both the Abbey Guest House in Craighall Park and the Windmill Guest House in Parkhurst. I doubt I would have ever discovered them had I not found myself in the strange position of being a visitor in my hometown and they have both proved to be lovely surprises. Should I ever find myself with a very full house and unable to accommodate friends, I’d have no hesitation in booking them in to either of these two ‘home-from-homes’. Abbey House from the Driveway. When the electric gate at Abbey House opened, I was quite surprised to find a very similar ‘farmhouse’ style house to the one we’re building. 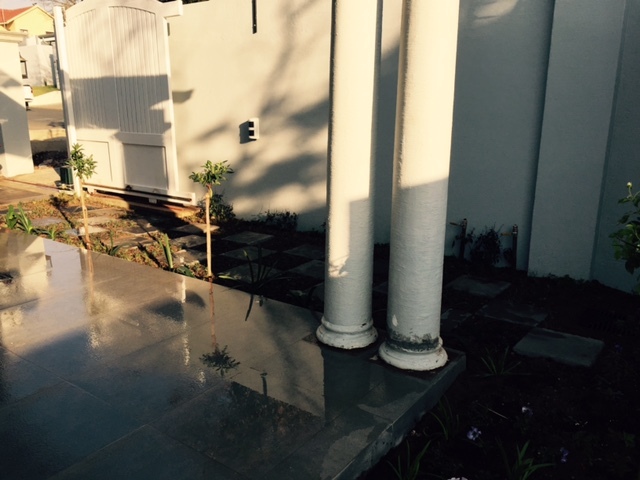 This guest house was custom built and there is plenty of secure, off-street parking which is essential in Johannesburg. 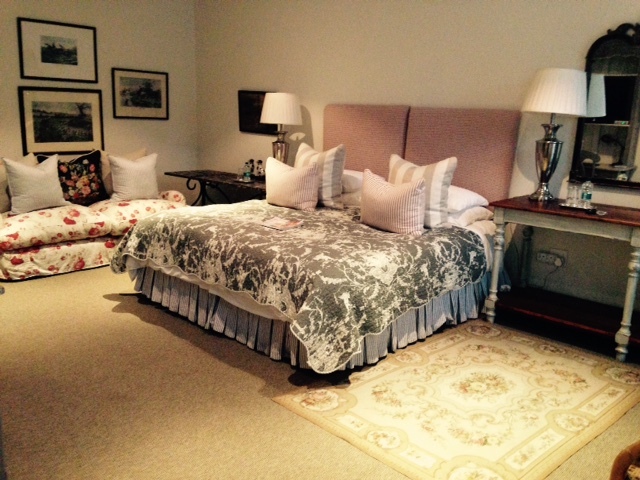 Bedroom – one of 11 rooms. 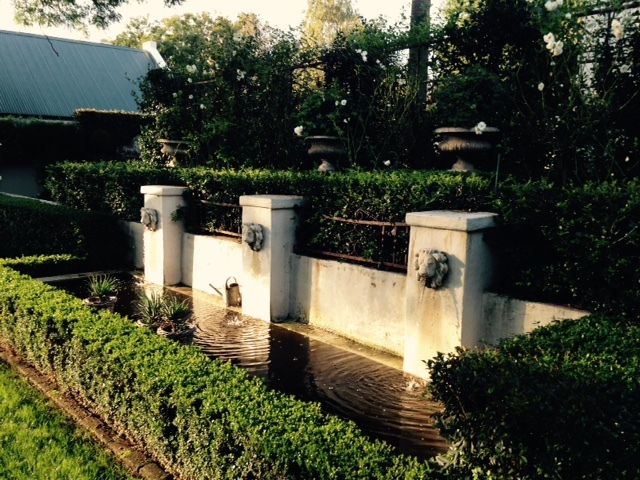 Water feature in the garden not unlike the one I am planning. 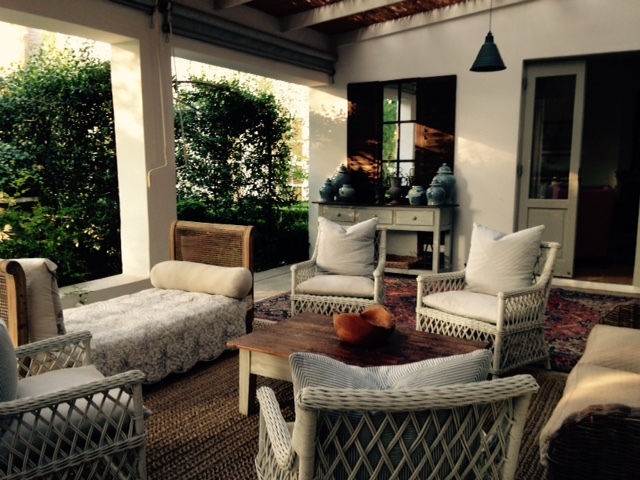 Another view of the veranda. If I could have simply transferred the entire veranda (with the exception of the Kudu head) to my new house, I would have been very happy. 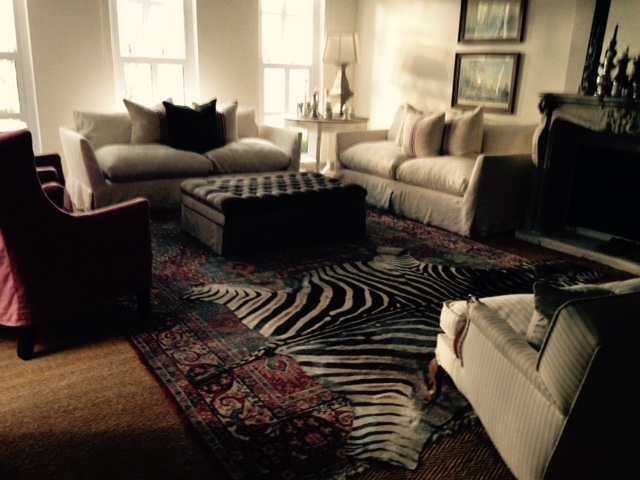 I loved the overlay of rugs on both the veranda and in the living room. 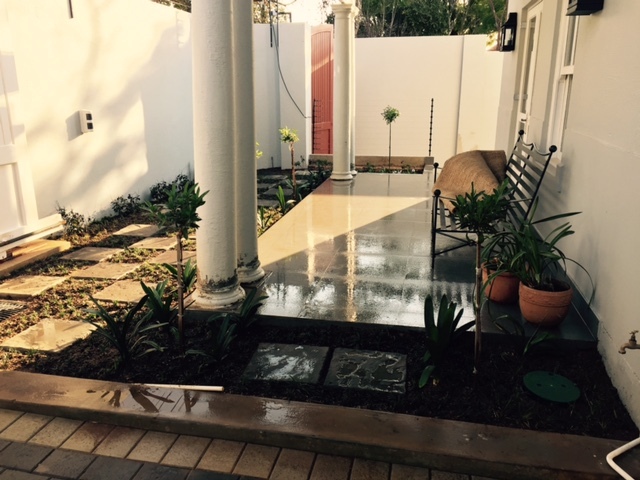 The floors of the entrance area, dining area and veranda at Abbey House were all done in a smooth concrete finish which we call cemcrete. I had requested it for my veranda but somehow or other, this had been misunderstood and the contractors – in my absence – had laid tiles instead. Becoming quite desperate to get the house finished, I had decided to simply accept them but, on seeing how beautifully the cemcrete flooring worked at Abbey House, I changed my mind, dug in my heels and insisted that the tiles be lifted. That would have been a messy and noisy job but fortunately I didn’t have to be there. We’re now waiting to have the originally-planned-for cemcrete surfacing poured. 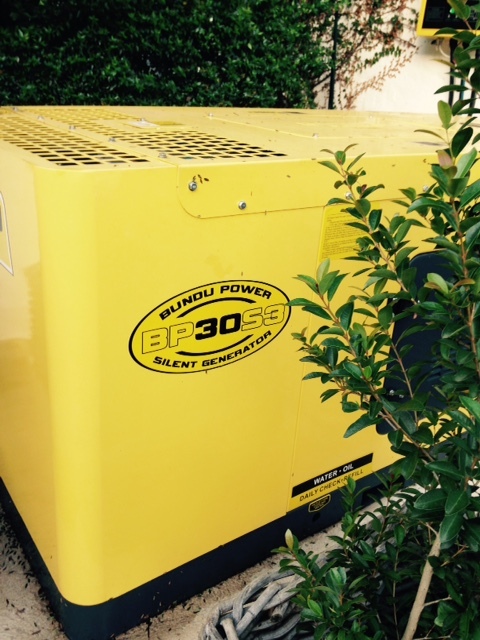 Big Generator in the driveway. 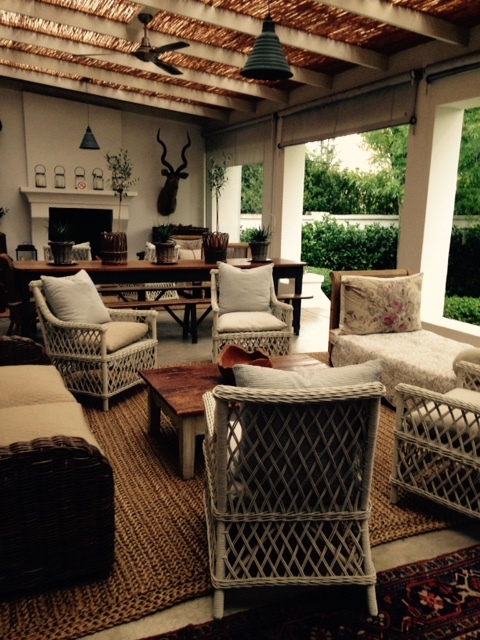 Generators are becoming essential for Guesthouses and hotels in Johannesburg with power outages becoming a daily occurrence. 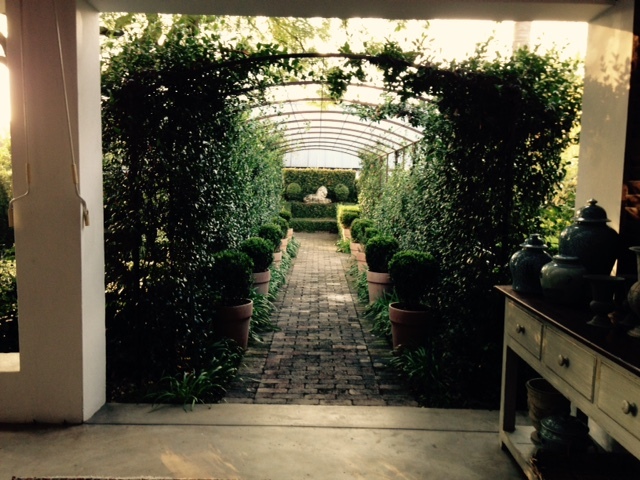 About 10 days after my stay at Abbey House, I needed to return to Johannesburg and found it was fully booked on the days I needed to be there so I set about looking for something else in the area. 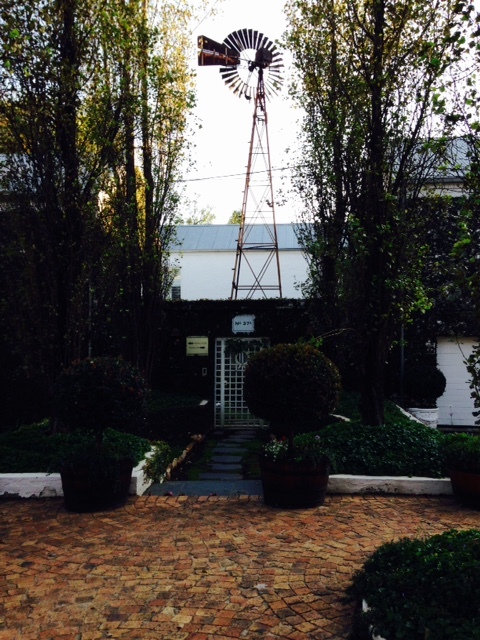 I decided to try Windmill House as I had been past it a few times on exploratory drives around Parkhurst, my new neighbourhood. 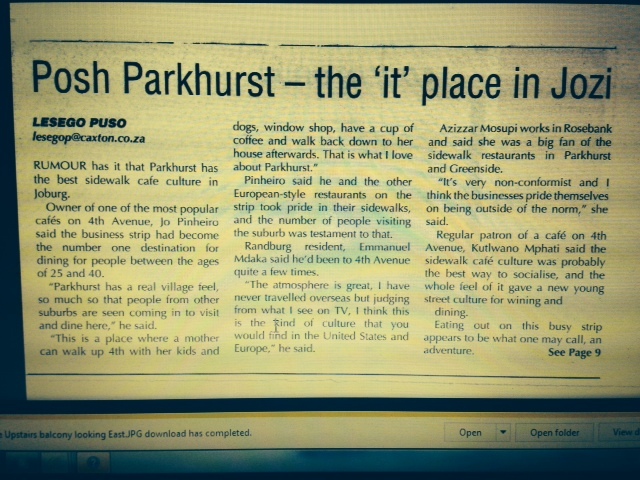 Article in a Neighbourhood Newspaper. (I’m not too sure about “Posh”. That seems to be pushing it a bit. But it has become a very popular neighbourhood for ‘starters’ and ‘downsizers.’ A friend who lives in Victoria, Canada, one described it as being a place for ‘Newly Weds and Nearly Deads’… This might be a good description of Parkhurst. We have friends who have moved back there for the more compact homes and gardens, having started out there between 30 and 40 years ago.) 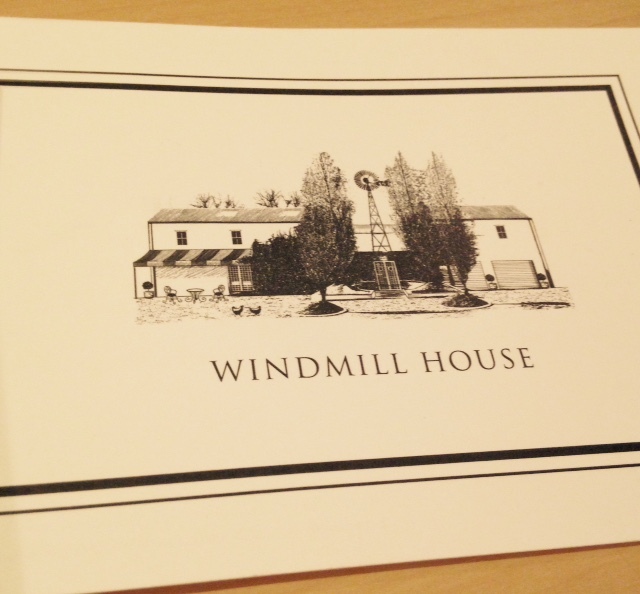 Windmill House describes itself as a B&B and is smaller than Abbey House, having only three suites. 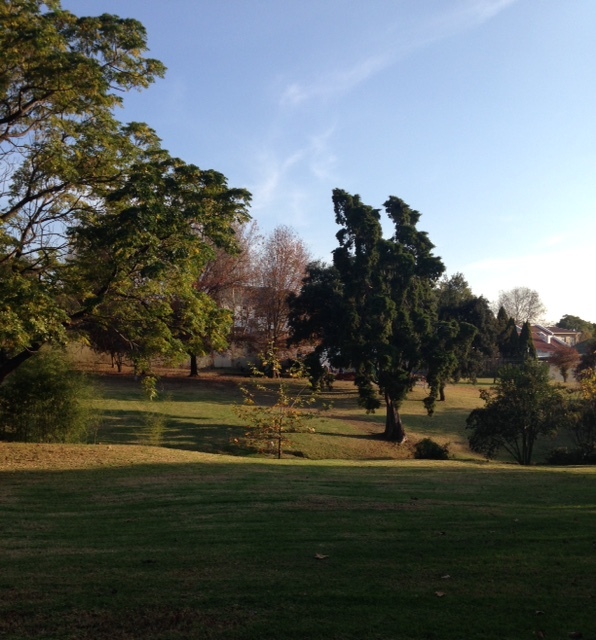 It is tucked away on what must be on of the last dirt roads in the northern suburbs of Johannesburg and it is nestled close to the same river that runs through the park in front of our new house. In fact the garden of Windmill House runs right down to the river. It is quirky and utterly charming. 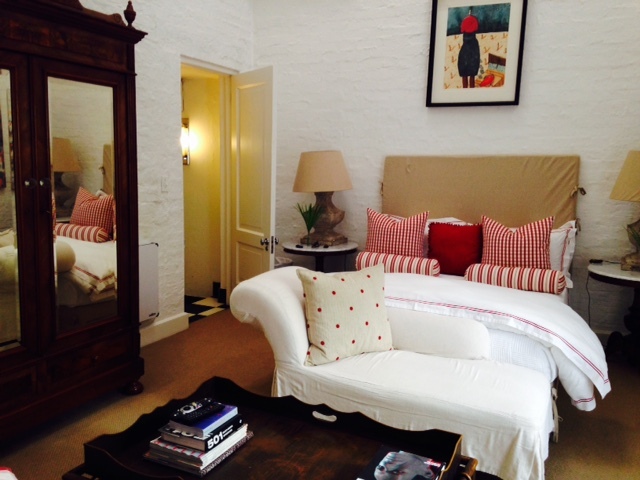 The bedroom had a double volume ceiling and exposed beams. 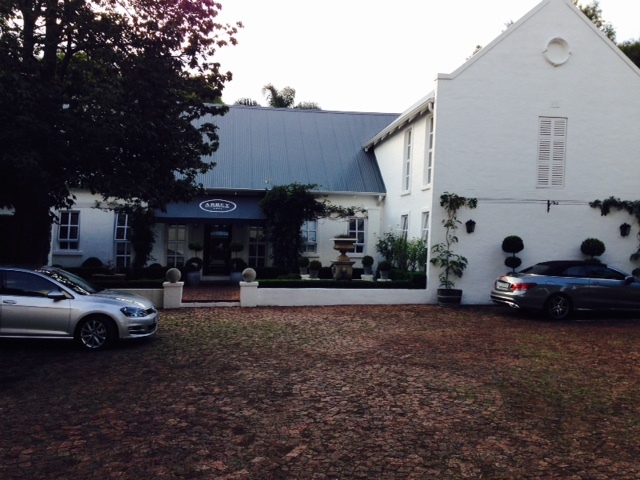 Driveway leading to pool and river garden. So although it is very frustrating to be trying to manage this building process from afar, there have been some upsides to going home as a visitor. Johannesburg is nothing if not full of surprises.